Wanting to get back to the Sierra Nevadas, I thumbed through my Backpacking California book to see what the closest options I had. I've already done several of the closer trips, so I decided on the Cottonwood Lakes loop through the Inyo National Forest. So Wednesday morning, I made the 3.5 hour trip from LA and arrived in Lone Pine at 1:30. After receiving my permit (and renting a bear canister), I headed towards the Horseshoe Meadow trailhead. 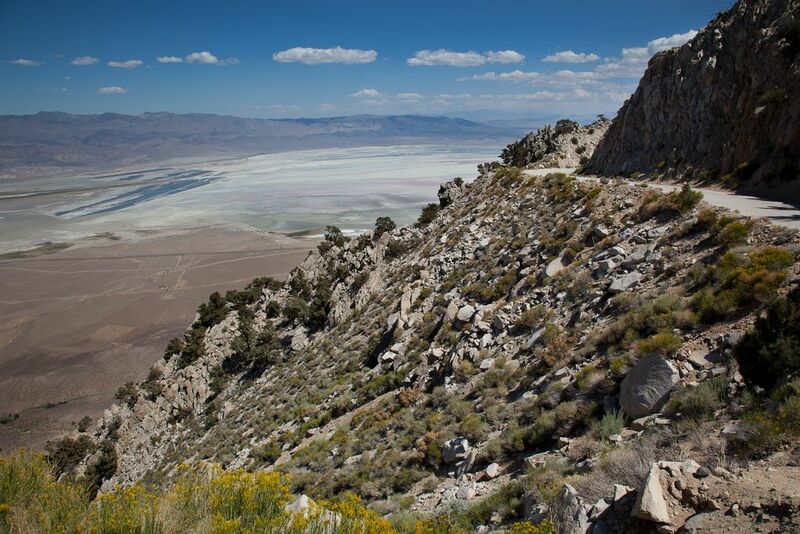 It involved a winding road that starts at an elevation around 3500 feet and soars up to 10,000 feet. The trail to Cottonwood lakes starts slow. For the first three miles, the trail is sandy and gives you the feeling of walking on the beach. 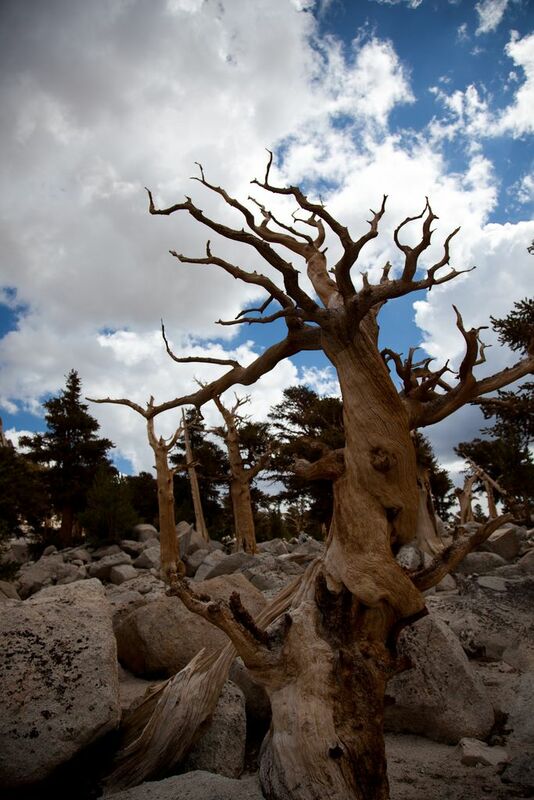 The surrounding landscape is scattered with pines growing from the sand, which looks as odd as it sounds. 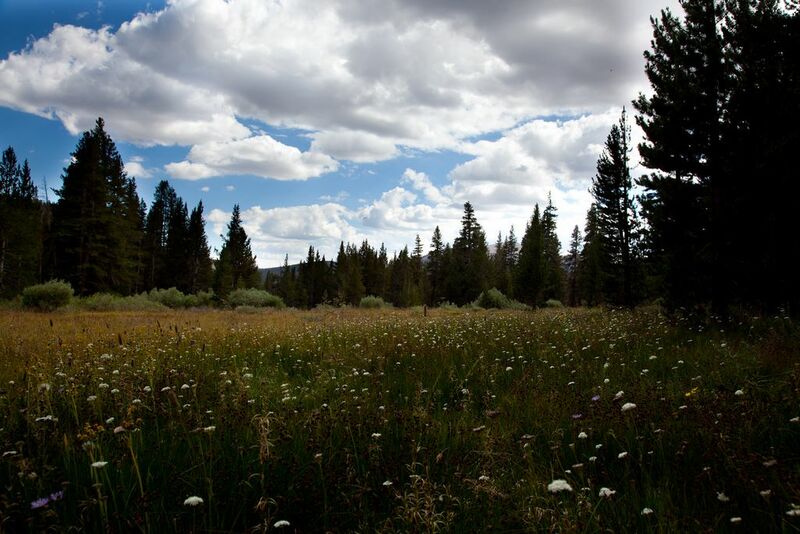 There are a few meadows sprinked with wildflowers along the way to mix things up. Eventually, you arrive at a split with the trail heading towards New Army Pass to the left and to Cottonwood Lakes on the right. 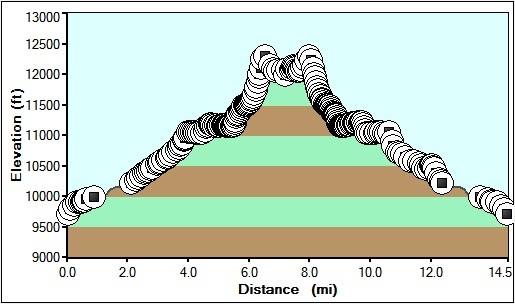 Going right gives you a little more elevation gain than the left. 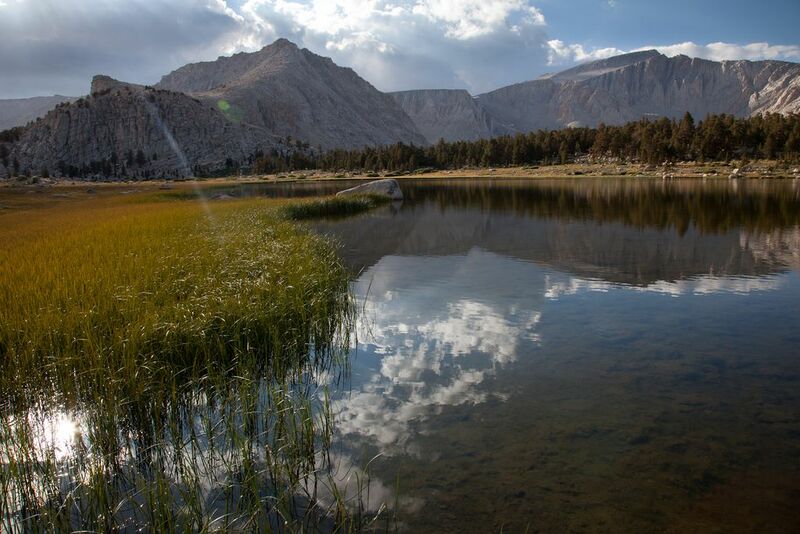 Since I was heading to Long Lake, I took the left fork and soon found myself at the first of the Cottonwood Lakes. The lakes were graced by soaring granite cliffs, with some of the rocks layered and fractured so that it looked like bricks stacked up. Finally, it felt like I was hiking in the Sierra Nevadas. A little past the lake, I came upon Long Lake, with my destination for the night being at the far end (which, living up to the name, was a long ways away). There was another camper in the main spot in the southwest corner of the lake so I continued on and found a nice area at the far west end. Shortly after getting camp set up and eating a hot meal, the sun started to drop towards the horizon before being enveloped by the approaching storm clouds. Without anyone else around to keep me company, I decided to lay down inside the tent and look through my photos from the day. 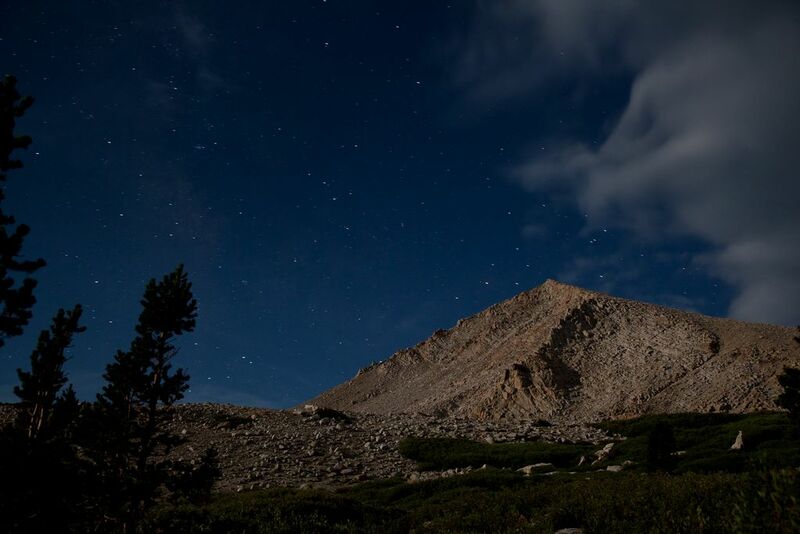 While relaxing, I looked up and noticed an intensely bright light peering into my tent. I thought it might have been my neighbor so I stuck my head out of the tent only to realize that it was a full moon beaming down on me. It was as bright as I think I've ever seen the moon and it was illuminating everything. I made use of the opportunity to take a few night shots and make use of my tripod that I lugged along with me. After thoroughly photographing everything I could, it was time to call it a night. The next morning, I was up by 7 but it was freezing outside and I didn't budge until the sun was well above the horizon. My original plan was to hike up New Army Pass and head to Chicken Spring Lake for night two before heading home. Instead, I decided that I would cut the trip short by doing a day hike up to the top of the pass, come back down and pack up camp before exploring the other Cottonwood Lakes. So that's what I did. My pack has a built in bladder so I took out everything heavy and non-essential, filled it up with water and jumped on the trail. 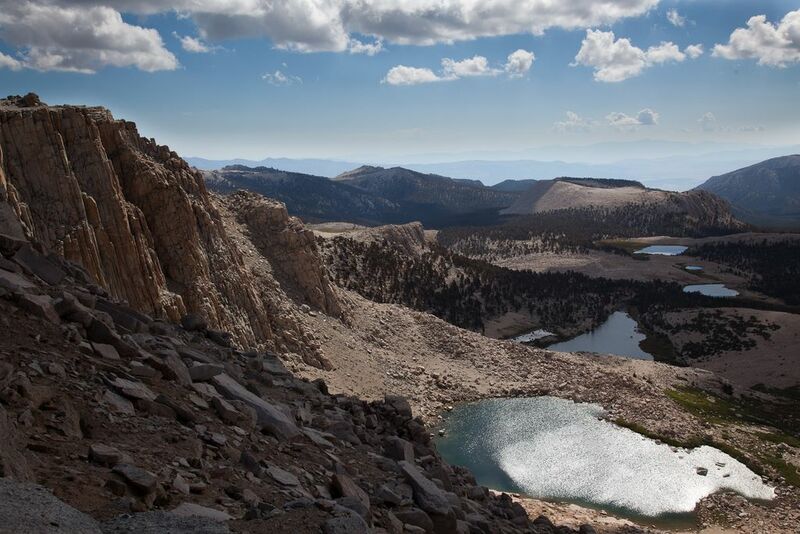 Right above Long Lake sits High Lake, which is a beautiful blue-green color lined with a granite peak. There's a sandy shore that was occupied by a single tent. Pushing past the lake, you hit some switchbacks and quickly start to ascend. The hard work is rewarded with views of the valley and the four lakes I passed on the trail. Finally, I arrived at the top of the pass and I find myself standing at 12,080 feet, the highest I'll be on my journey. My campsite is over a thousand feet below me. To the east, there are large white granite peaks and very little green. I headed off trail towards the north to check out the view of the upper Cottonwood Lakes. The two lakes rest at the bottom of some very steep cliffs so I edged closer and closer to the side to take a few shots. All the while , my heart feels like it's going to thump straight out of my chest. Looking to my right, I can easily see that the stability of the rocks isn't what I would hope for and it seems the ledges could drop at any moment. After flirting with death, I decide that it's time to head back down. On the way, I stumble across a marmot sunning himself on a nice rock. I had seen several marmots the previous day, but this one let me get about five feet to him before he dove under his rock for protection. I don't know what it is about the high elevation, but I saw about twenty marmots during my 24 hours in the park. Heading back down, I started to encounter other hikers. First a couple of guys heading to Mt. Whitney, a few solo hikers and a few day hikers. Overall, the trails weren't packed but they also weren't deserted. It seemed this was a pretty well traveled portion of the Sierra Nevadas, but I'm fine with sharing. Once I made it back down to camp, I filled up my water bladder and packed everything up. The journey back was fairly uneventful aside from seeing a slew of marmots, chipmunks, and pikas. The wildflowers were nice, but perhaps a bit past their peak. Overall, the trip was a great over nighter with a definite option for a longer trip.